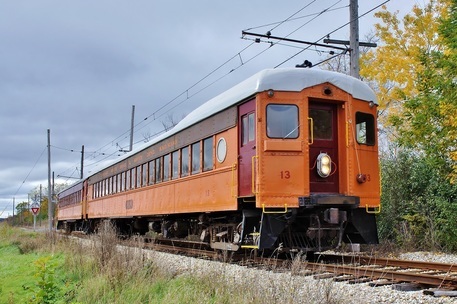 These cars were in South Shore Line daily service until 1982, when the "orange fleet" of the South Shore Line was finally retired. Some of these cars are estimated to have run up over six million miles apiece in service. Car 13 was lengthened in the World War II period when passenger loads were high and obtaining new cars was not possible. Unlike some cars that were lengthened, car 13 did not have larger sealed windows and air conditioning installed. The car seats 80 which makes it the highest seating capacity car at the East Troy Railroad Museum and therefore regularly in service for our popular events when ridership is high.